Once we have achieved the ‘ultimate tone, how can we boost that same tone without changing the quality? What if we want to boost the signal before your drive effect in order to increase sustain, or have a boost in front of your gain channel and another after the pre-amp in the effects loop? 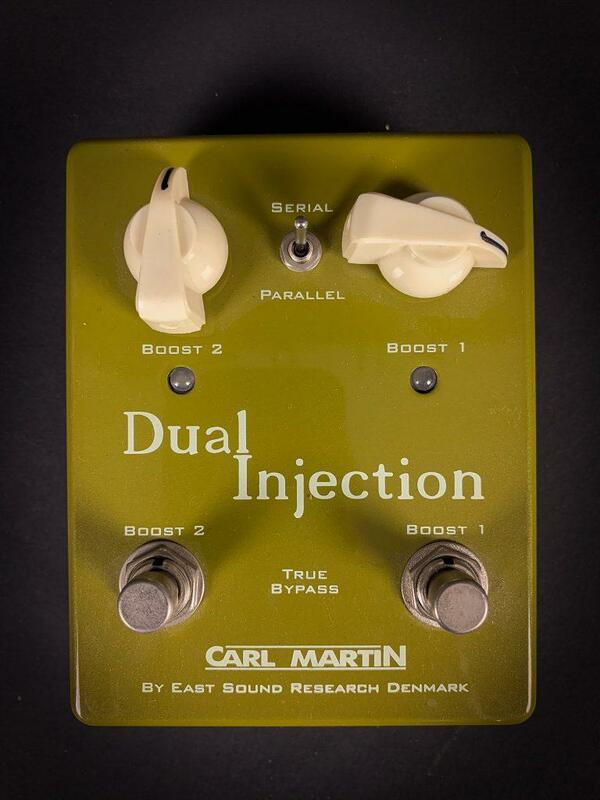 Well, Carl thought about this for quite a while and is now happy to introduce the super cool….’Dual Injenction’! Carl took the high quality, transparent boost from the Hot Drive’n Boost, and put two of them into one pedal. Each has it’s own level control and ‘True Bypass’ switch, plus there is another toggle which switches the Dual Injection between Serial and Parallel modes. In Serial mode, you use the Input/Output 1 on the back of the pedal and place the boost wherever you want in the signal chain. In Parallel mode, connect the Output 1 before your Drive or Preamp, and then use the Input/Output 2 on the side of the pedal to connect to your effects loop on the amp.